Hello all , in a while we will be doing Chinese New Year as our topic. I would like to ask if you have any items in anyway linked to China that you would like to share with us or donate it would be greatly appreciated. It could be a pair of chopsticks or a chinese flag or a golden cat or a oriental dragon model to name but a few. Any input is appreciated. We have enjoyed our first week back at playschool and hope all the children have to ! Unfortunately I have to report that our toy shed was broken into over the Christmas Break and our garden decorations were vandalised . In a couple of weeks we are doing all about ourselves, please could you bring in over the next couple of weeks some photos your child’s family,pets and home etc. Happy New Year to you all and hope you all had the Christmas you wished for. Remember that we return to playschool on Monday 7th January, look forward to seeing you all. Just a quick update as we near the end of term. The last day of playschool is Tuesday 18th December. Please ensure all fees paid by Friday 14th December. For the last week of term we will be playing Christmas party games with the children, please feel free to send them in fancy dress or Christmas clothing. Thank you for all you contributions of baby bits for role play, the children have loved it. Please can you start to consider what sessions you require in January. If you think you maybe eligible for 30 hour funding, you need to be applying now, see the link in our sessions and pricing page. If unsure please ask myself or Jayne. Children starting Primary School in September 2019! Friday 5th October Playschool will be joining Bethersden Primary School for Harvest Festival at St.Margret’s Church at 1.30pm. Baby Bottles and feeding items. We would like to use real items rather than toys to improve play. I hope you have all had a nice summer break! This is a reminder that Playschool will be resuming from Wednesday 5th September 2018. Best Wishes to Leavers 2018! 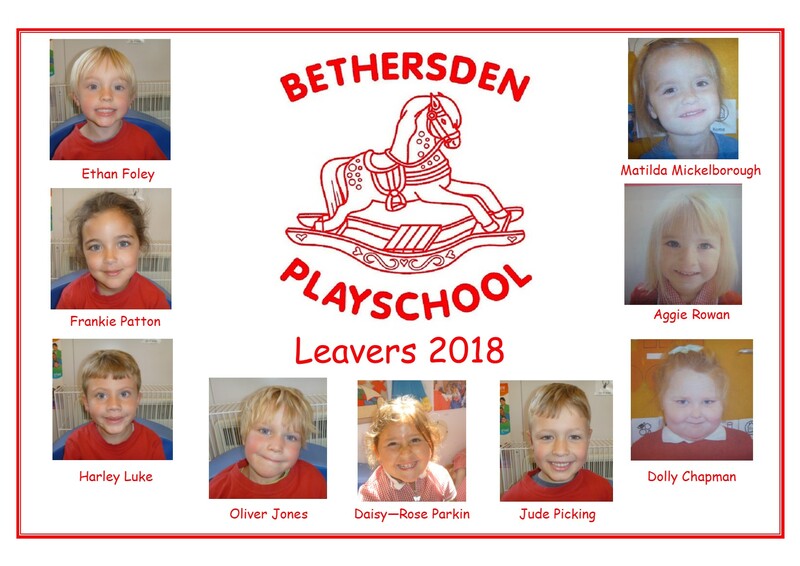 We wish all of our 2018 leavers all the best at primary school!